5th match of ICC Worldcup 2015 was played between Ireland and West Indies at Adelaide Oval today. 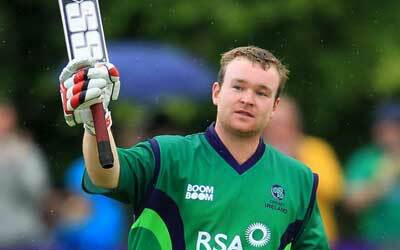 Ireland with supre duper batting preformances won the match by 4 wickets over West Indies. PR Stirling (Ireland) declared man of the match for his splendid batting of 92 runs of 84 balls. Earlier, Ireland won the toss and put West Indies into bat first. West Indies made stedy start but, lost 2 quick wickets in 8th over. DR Smith 18 and DM Bravo unfortunately got run out for a duck in 8th over. MN Samuels started well well but, lost wicket scoring 21 runs. CH Gayle also gone contributing 36 runs. Lower order batsmen LMP Simmons 102 runs and DJG Sammy 89 played quick cricket and put West Indies on huge score of 304 runs at the enf of 50 overs. Following huge target of 305 runs, Skipper WTS Porterfield started inning with PR Stirling. Both played sensible cricket initially and made 71 runs partnership before WTS Porterfield lost wicket scoring 23 runs. EC Joyce joined with PR Stirling and played superb cricket in middle overs. PR Stirling played well and made quick 92 runs of 84 balls. EC Joyce also contributed quick 84 runs of just 67 balls. Now, NJ O'Brien took the charge in hand and played stroming inning of 79 runs on 60 balls and gave Ireland remarkable win over West Indies by 4 wickets in 45.5 overs. PR Stirling (Ireland) declared man of the match for his 92 runs from top in 84 balls.